Donald Trump will be a strong leader for America and has a “deep understanding” of the Middle East, Egyptian President Abdul Fatah Sisi said. 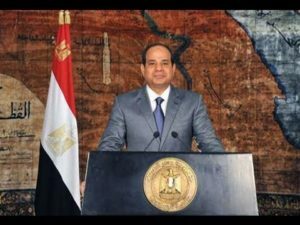 “I believe that President Trump will be vigorously engaged with the issues in the region,” Sisi said in an interview with Portuguese news agency LUSA on Nov. 19. Trump has a clear path to restore relations between Egypt and the U.S. that became tense after the ousting of Islamist President Mohammed Morsi, who the Obama administration had supported. The Egyptian president said in the interview, “let’s not jump to conclusions or worry” about future U.S. actions or policies in the Middle East. Egypt’s pro-government media supported Trump’s win the Nov. 8 election. Many believe Trump will be able to offer international political support as Sisi battles the Islamic State of Iraq and Levant (ISIL) insurgency in Sinai.